All good things must come to an end, so this is my last batch of Rice Krispie Treats — at least for now. This weekend we’re co-hosting our annual Memorial Day party with the neighbors and I’m thinking Red, White and Blue, but today’s treats are Neapolitan, which is a word I really like to say. For the strawberry layer, I used Strawberry Quik. It worked well because the flavor was subtle and tasted like strawberry milkshake. The Quik added a bit of pink, but a few drops of red food coloring were still necessary to get the desired pink shade. The other layers are pretty much the same as before, but less. This batch is made in a loaf pan. For a big batch, triple everything and use a 13×9 inch pan. Melt butter in a microwave-safe mixing bowl (45 seconds on high). Stir Strawberry Quik and food coloring into melted butter — use enough red coloring to get a dark pink hue. Add the marshmallows and stir to coat with pink butter. Microwave marshmallows for 30 seconds; stir until melted and smooth. Add cereal and stir to coat. Empty into the loaf pan and press down well, using a piece of parchment or Release foil to prevent sticking. Rinse out bowl (no soap!) and repeat melting procedure with Layer 2 – add Cocoa Krispies to melted marshmallows, then stir in chocolate chips. Empty onto strawberry layer and press down as neatly as possible, using parchment or Release foil. Repeat melting procedure with Layer 3. 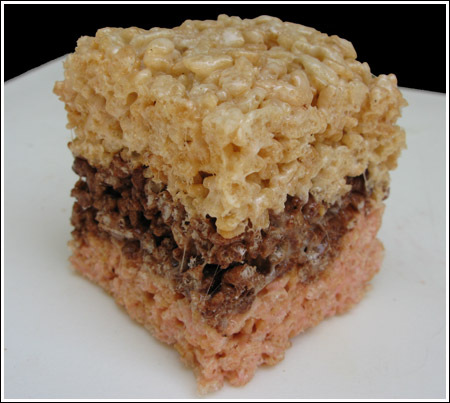 Add Rice Krispies, stir to coat, then layer on top of the chocolate layer. Press flat. At this point, your bars should be at the very top of the loaf pan. Lift from pan and set on a big cutting board. Using a Chef’s knife, slice a thin layer off each end of the loaf to trim. Slice lengthwise down the center, making two long sections, then slice the loaf cross-wise to make 6 big squares. These were so good! I doubled the chocolate section to make the middle the focal point. I put these on my website b/c they were so good (I cited you of course). My family said that they would never eat regular rice krispies again. I think the strawberry marshmallows would be great! I’ve had kind of a hard time finding the strawberry marshmallows. Have you ever tried the strawberry layer with strawberry marshmallows rather than using the Quik? I’ve made these before, 1/2 chocolate and 1/2 regular but never thought about adding strawberry. I thought about making these for a bake sale and was wondering if the strawberry marshmallows would have enough strawberry flavor. It sounds like you have overcooked the marshmallow. If you are going to melt them on the stove, and not the microwave, use low heat. Keep over heat until the shmallows are almost completely melted, and then take them off the heat and stir until completely melted. This will keep the temperature low enough to not cook the Krispies when you mix it all up. Good luck! I love your site! I made some peanut butter cookies the other day, the double delight pillsbury ones and everyone loved them. Anyway, these rice krispy treats. I made some once cuz they seemed really easy and tasty, and they looked and tasted ok…until something weird happened. The rice krispies like…burned, or set or something and the marshmallow went caramelly. I just wanted a gooey, big chewy krispy bar but it was deflated, the krispies were too crisp on the outside and hard to chew and then the marshmallow ‘disappeared’. ??? I melted the butter and marshmallows over a lowish heat in a pan then added the krispies and coated them in marshmallow then into a tray and refidgerated…did i do something wrong? Should I not put the krispies in the pan? How clever are you! I can so see doing this with kids who would have a blast with the flavors. Brilliant! Went to the store (for other things) but with the intent to buy rice krispies foe – the only ingredient I didnt already have… Low and behold I lef the checkout, loaded the car and got to far away when I realized I had none. ugh Will have to try again tomorrow. As your last batch of krispie treats for a while, I’d say this batch is a PHENOMENAL way to end – yum! They look yum and fun! Hey, that’s neat! Kudos to you for coming up with it!! !